Greetings, and welcome to huntingoptics.net! When you’re on the prowl for a good scope, you might find yourself bewildered at all of the choices available to you. Nikon, the famed camera manufacturer, also has built a name for itself in sport optics, building some truly great scopes for rifles, muzzleloaders, shotguns, and even crossbows. Let’s take a look at some of the top choices you can opt for from Nikon, and let you know what you can expect from the company’s shooting glass. What’s The Best Inexpensive Nikon Scope? 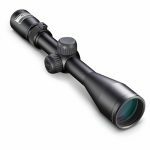 In terms of an all-around hunting scope for your rifle at a budget-friendly price, the Nikon Buckmasters II 3–9×40 BDC riflescope is an excellent choice. It provides you with a best-in-class warranty and replacement program, but even better than that is the overall quality of the glass. Its magnification power is terrific for hunting, ranging from 3X to 9X, and it offers fully multicoated optics for fantastic light transmission. The drawbacks to the Buckmasters II is the lack of an illuminated reticle, the scope’s short eye relief, and the fact that you don’t get rings along with it. What Is The Best Nikon Scope Money Can Buy? If you want the best of the best from Nikon, the Monarch 3 4–16x42mm riflescope is probably the choice for you. This glass offers zoom levels from 4X to 16X, with fantastic crispness, clarity, and contrast throughout the entire magnification range. The scope provides plenty of eye relief, keeping your forehead and eyebrow safe from the recoil of even the highest-caliber rifles, and the light transmission is stellar. The two major drawbacks of this optic are the non-illuminated reticle and the absence of a locking mechanism for the quick-focus eyepiece. Does Nikon Manufacture Red Dot Sights? The closest you’ll come to a red dot sight from Nikon is a 1X scope, such as the Monarch 3 1–4×20 BDC riflescope. The manufacturer doesn’t produce dot sights, choosing instead to focus on building some of the best scopes you can find. Does The Company Make Its Own Scopes? A renowned optics manufacturer, Nikon produces all of its own products. This way, the company can ensure that every product bearing its name lives up to the manufacturer’s reputation. What Are Some Common Features Of Nikon Scopes? While it isn’t a universal characteristic, most of the glass produced by Nikon is available with its patented BDC reticle. This particular crosshair variant offers open-circle range compensation markers that are see-through, allowing the shooter to maintain a positive visual of the exact point on the target where the shot should, in theory, hit its mark. Another common feature of Nikon’s scopes is the compatibility with the company’s Spot On Ballistic Match Technology, an app-driven utility that allows the shooter to precisely determine the range of each reticle marker based on the particular ammunition and load being shot. How Good Are The Optics In Nikon’s Products? Almost all of Nikon’s optics are high quality. The manufacturer uses BaK–4 prisms almost exclusively, and fully multicoats the glass surfaces to maximize transmittance. Generally speaking, Nikon doesn’t skimp on quality to keep its prices down. Conversely, the company innovates within the industry to reduce manufacturing costs while still providing excellent products that will last for years. What Can I Expect From The Reticles? Most of the reticles in Nikon’s repertoire are wired reticles as opposed to being etched in the glass. This, of course, can theoretically lead to the reticles failing, but I’ve never experienced this or heard of it happening. Perhaps the best reticle Nikon uses is its patented BDC variant, which features the aforementioned open-circle design. I’m a huge fan of these crosshairs, since they make it possible to see exactly what my bullet should hit, without anything obstructing my view. Are Nikon’s Scopes Compact And Lightweight? While they aren’t the lightest, most compact scopes on the market, Nikon still managed to produce products that are reasonably-sized. You won’t generally notice the added weight of Nikon glass, unless your rifle or handgun is exceptionally light. How Powerful Are These Scopes? How powerful do you want? 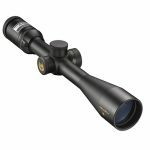 Amid Nikon’s vast catalog of hunting optics, you’ll find everything from the basic 1X to 4X scope all the way up to the Monarch 3 6X to 24X monster scope. Just about every Nikon scope I’ve ever put my hands on, if not every single one, has offered fantastic color reproduction, contrast, crispness, and clarity throughout the entire range of magnification. Will I Be Able To Use Nikon’s Glass In Low-Light Conditions? The majority of Nikon’s scopes fail to provide you with illuminated reticles, but that doesn’t make them ill-suited for low-light hunting situations. Thanks to appropriately-sized objective lenses and excellent optics quality, light transmission usually meets or exceeds the “theoretical” maximum transmittance of 95 percent. Almost every Nikon scope I’ve owned has had its turn to either have my back or let me down in low-light hunting conditions, and none of them have ever failed me. Nikon’s glass almost always offers a field of view that is at least on par with the competition. You’ll be able to readily see plenty of terrain around your target, even with maximum magnification, facilitating an easy time of leading game that’s on the move. How Simple Are Nikon’s Scopes To Mount And Sight In? Nikon’s scopes don’t come with rings, but almost all of them incorporate 1-inch maintubes into the design, allowing you to make use of any such sized scope rings to mount your optic. Be sure to start off your process of sighting in your scope by using a laser bore-sighting tool, and you’ll find yourself shooting tight patterns on the bull’s eye in no time flat. Nikon really knows how to make a product that it can cover with a lifetime warranty without breaking the bank. All of the Nikon glass I’ve come across is waterproof, fogproof, and shockproof. Through a combination of durable manufacturing materials along with excellent manufacturing standards and processes, Nikon’s scopes are built to withstand plenty of use and abuse in the worst weather conditions. Thanks for reading my thoughts on Nikon’s lineup of various scopes. In short, you really can’t go wrong with Nikon glass. Their products might not be perfect, but they maintain an excellent balance of quality and affordability.